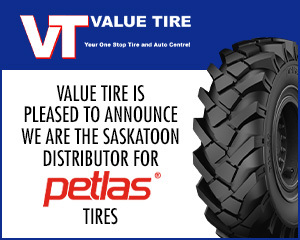 The Value Tire group of companies (with locations in Yorkton, Regina, and Saskatoon) is an independently owned and operated Saskatchewan family business with its head office in Saskatoon, Saskatchewan. The original family business began in 1953 when William and Francisca den Brok opened Saltcoats Welding which evolved from a blacksmith shop to a service station which sold gasoline and repaired both automotive and farm vehicles. The den Brok's four sons - Theodore, Gordon, Paul and John purchased the service station in Saltcoats in 1984 and continued operating that location until 1998. In 1985, the partnership of den Brok brothers opened Value Tire & Battery in nearby Yorkton, Saskatchewan and by 1988 they were expanding the business to include automotive repairs as well as retail tires & battery sales. A new facility was needed in Yorkton by 1994 to accommodate the growing business. The expansion of two additional truck bays is currently underway at the Yorkton location with an expected completion date of early 2011. In 1995, the partners expanded once again by opening a second location to serve the southwest corner of the province, that location is Value Tires (Regina) Ltd. The third location was opened in Saskatoon in 1998 with construction of the new 13,000 square foot building at the current Value Tire (Saskatoon) Ltd. Head Office location being completed in 2003 to keep up with the demand for services. Further expansion in Saskatoon involved the building of a new 18,000 square foot tire warehouse in 2009 to serve the company's retail and wholesale customer needs by providing a large inventory with a wide variety of product options. After many years of service, Theodore retired in 2013 and Paul retired in 2016. We continue to grow and opened a new location in Saskatoon in 2017. View our online locations list for a full list of addresses and accompanying hours of operations. So come see us in person, or contact us by phone today as available appointment spots fill up quickly! Wherever you live in Saskatchewan, Value Tire should be your one-stop shop when considering new tires or wheels. We pride ourselves on maintaining a competitively priced line of tires. Feel free to browse our Tire Size Finder online from the comfort of your home to view our wide selection of competitively priced consumer tires, commercial tires, farm tires, and industrial tires from the industry’s leading tire brands, like MICHELIN®, BFGoodrich®, and Petlas. At any one of our locations in Yorkton, Regina, and Saskatoon, our tire sales staff will match you up with the right set of tires based on your specific driving needs and preferences. If you are looking to keep your tires performing as they should well throughout the entire tread life of the tire, consider some of our professional tire services, such as computer spin and road force balancing, tire rotations, and flat tire repairs, performed by our trained tire technicians. We are part of the Michelin network of Alliance Dealers, totaling more than 160 locations across Canada. Our automotive technicians can handle a variety of automotive repair services like wheel alignment, TPMS repairs, diagnostic services, brake repairs, replacement of belts and hoses, exhaust system repairs, preventive maintenance, and steering and suspension system repairs. We deliver extensive auto repairs to satisfied customers throughout the Saskatchewan area. Check out a comprehensive online list of maintenance and repair services offered at each of our locations. Come into any Value Tire location for a quote on an automotive repair service, or simply schedule your next service appointment by phone today. Value Tire is Your One Stop Tire & Auto centre.